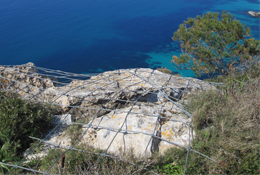 DELTAX® high-tensile steel wire mesh is a cost-effective solution to protect people and infrastructure against rock fall and slope instability. It also has various other applications, including use in the protection of historical sites and buildings, fencing and anti-rodent installations. It's low weight allows DELTAX® mesh to be installed without the use of heavy machinery. It is quick to install as it is simply rolled out and can be shortened to the required length. It adapts optimally to the terrain. 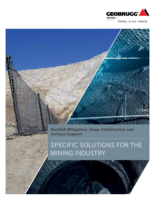 Chain-link design: The DELTAX® mesh can be easily shortened by unwinding a netting spiral. Leftover partial rolls can be reused as there is no damage caused by shortening. Esthetically pleasing: the 2 mm thin wire lies unobtrusively on the ground. The thinner wire of DELTAX® needs less steel than hexagonal mesh, leading to a much lower CO2-footprint.